Brush your hair. Don’t bash it. Eat your way to healthy hair! If you’re craving gorgeous locks, all you need to do is eat! The answer to your effortlessly gorgeous hair lies in easy, fresh dishes you can whip up at home. Let’s explore the goodness that’s hiding in your kitchen. Hair is made of protein and protein is needed for hair growth and strength. Whether you are vegan, vegetarian or the eat-anything-on-legs sort, you need a minimum of 40-50 grams a day (or a portion serving of protein that’s the size of your palm). The protein in lean meats like chicken, eggs and fish or dals, pulses and paneer is essential food for healthy hair. Omega 3 isn’t produced by our body. And your scalp needs this fatty acid for a hydrated scalp! So if you want shiny, lustrous hair, remember to pick that salmon dish the next time you’re out for dinner. If you’re not particularly fond of fish, you can also get small amounts of Omega 3 from flax seeds, hemp seeds and chia seeds. If you need a healthy head of hair, the blood flowing to your scalp needs iron. Your hair follicles thrive on it. So stock up your plate with green leafy veggies, red meat or nuts - all high in iron content. And did you mention hair fall concerns? Out the window for sure! Those mixed fruit smoothies are great food for healthy hair. Know why? Because tropical fruits like orange and guava are high in Vitamin C. This vitamin has collagen which helps hair growth. If you’re combatting hair breakage, make sure you eat at least 75 milligrams a day (which equals one full orange, or just half a guava). This is your go to amino acid if you’re looking for hair strength and vitamins for healthy hair. Your body turns Vitamin A into beta carotene, which is part of the composition of your hair along with protein. You can find Vitamin A in sweet potato and orange vegetables like carrots and pumpkin. If those don’t take your fancy, throw in a few extra curry leaves in your next tadka, which also has anti-greying properties. Used in the formation of new cells, Vitamin B12 helps regrow hair. It can mostly be found in eggs, yoghurt, yeast, organ meats (such as mutton liver) and breakfast cereals. Amongst all the vitamins for healthy hair, B12 has the strongest effects on hair regrowth. A favourite with dermatologists, zinc is usually a supplement doled out to prevent hair loss. That’s because cells that are in charge of growing your hair depend on this food. Highest quantities are found in shellfish like prawns, oyster, crab and lobster. Dark chocolate also contains a generous amount. You can get smaller doses from chickpeas, flax seeds and garlic. Selenium is a mineral that combats dandruff and fights problems like grey hair. It also prevents hair loss when included in your diet along with zinc-rich foods. Sunflower seeds, oats and mushrooms are sources rich in selenium. Biotin may actually help reverse hair loss and strengthen your brittle hair. This essential mineral is an important building block in the process of hair growth. If there’s a good amount of biotin in your body, it contributes to the production of healthy hair and nails. That’s why doctors highly recommend it as a supplement for hair loss. Ways to include biotin naturally in your diet: almonds, cheese, bananas, berries, cauliflower. They are ideal vitamins for healthy hair and when taken together regularly protect you from hair loss. Vitamin D is not just sunshine, you can get it from egg yolk, orange juice, soy milk and cheese. Fatty fish like tuna, mackerel and salmon also contain a good amount of Vitamin D. Milk products are the first pit-stop for calcium, but you can also get it from figs, beans and leafy greens like cabbage and black-eyed peas. 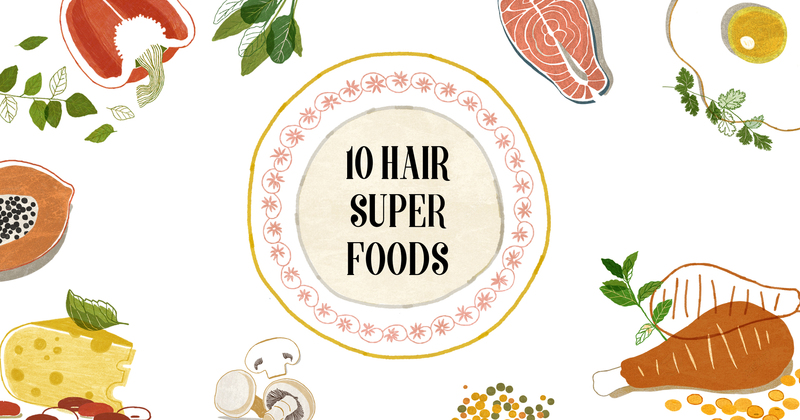 A balanced diet of food for healthy hair is all you need for those bouncy, lively locks. So skip the visit to the salon and update your grocery list instead. A major part of good hair growth is your food habits. Whether vegetarian, non-vegetarian, vegan or otherwise – substitutes can always be found. Nutrition is important! Mix your diet up with a variety of vitamins, minerals and more.